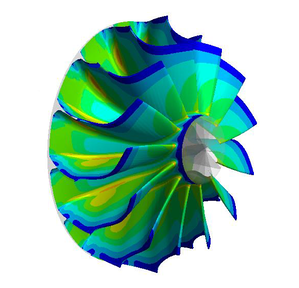 Advanced Design Technology was asked by a leading automotive manufacturer to use TURBOdesign Suite to optimize their turbine stage efficiency at four different operating conditions. ADT used 3D Inverse Design code TURBOdesign1 and its integration with Ansys to provide a final optimized design with a clear improvement in total efficiency compared to the already highly optimized baseline design. To optimize turbine nozzle and rotor blades in order to maximize the turbine stage efficiency at four different operating conditions with different nozzle setting angles. It was also necessary to maintain or improve the Moment of Inertia (MoI), maximum stress and vibration frequencies (first and second mode). Final optimized nozzle and rotor blade geometries which meet the client's design targets. 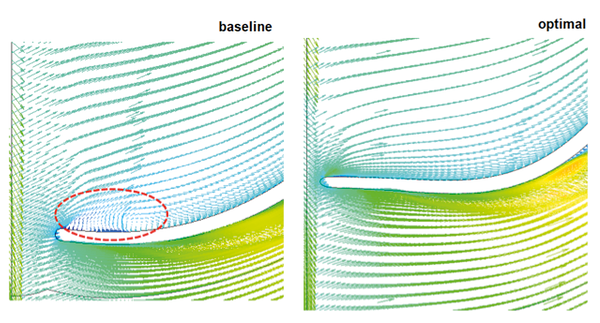 A response surface model (RSM), built using Kriging, based on the design matrix obtained from a number of Design of Experiment (DoE), CFD and FEA calculations that can be used to quickly perform optimization using different constraints and objectives. CFD results showed that the final optimized design provided a 1.2 percentage point improvement in total efficiency, which is defined using different weighing factors at the four different operating conditions. The results showed a 6.6% lower MoI, 2.1% lower blade stress, 8% lower backplate stress, same first mode frequency and 4% lower second mode frequency compared to the baseline, which was already a highly optimized design. The design process presented in the consultancy summary is applicable to all types of turbines and turbomachinery designs where complex multi-disciplinary, multi-objective and multi-point operations are required.